While scrolling ESPN earlier in the week, I caught the video clip that discussed the 1984 assassination of Malcolm Kerr, father of Golden St. Warriors coach Steve Kerr who was only 18 and a freshman basketball player for the Arizona Wildcats at the time. What a moving story that I believe has helped shape Steve Kerr into the man he is today. At the time of his death, Malcolm Kerr was the president of an American University in Beirut. His goal was to bridge the gap between Christians, Muslims, and Jews. His assassination was the same kind of terrorism that has shown religious views could lead to unnecessary violence. Former President Ronald Reagan issued a statement after Kerr’s murder. After his father’s death, Steve discussed how he grew up in Lebanon, but never could have imagined something happening as tragic as his father’s death. Kerr needed to focus on something other than his father’s death. He did not travel to Lebanon for his father’s funeral services. Instead, he went 5 for 7 from the field against rival Arizona St. in what would be one of the better games of Kerr’s freshman year. With much love and support from his basketball family at Arizona, including coach Lute Olson, Kerr was able to overcome this personal tragedy and persevere. As a senior, Arizona St. fans chanted derogatory comments about Kerr’s father. He was so angry inside, but Kerr used that anger to hit six three pointers in the first half of an Arizona victory. By the time Kerr graduated in 1988, people were talking about him as a player who could play in the NBA. He was drafted in the second round as the 50th pick by the Phoenix Suns. Kerr played for the Suns, Cleveland Cavaliers, and Orlando Magic before finding a home with the Chicago Bulls in 1993. I am sure his 15 year NBA career was fueled by a burning desire to be a success despite facing such a horrible loss at a young age. 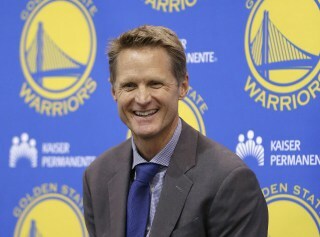 Kerr won three NBA championships with the Bulls and another two with the San Antonio Spurs as a designated sharpshooter from beyond the three-point arc. As a rookie coach this season, Kerr led the Warriors to a NBA best record of 67-15 and the NBA finals where his team holds a 1-0 series lead over the Cleveland Cavaliers. A big part of his coaching philosophy is that your team is an extension of your family like his teammates and coaching staff were a tight-knit family in college. When Kerr first took over the Warriors, one of his first decisions was meeting with Harrison Barnes who he knew was unhappy in his role last season under former coach Mark Jackson. Barnes said the two of them talked for over an hour and Kerr gave him nothing but honest responses which is all Barnes said he has wanted in a coach. It comes as no surprise Barnes has had a strong season under Kerr averaging over 10 points and 5.5 rebounds per game starting at small forward. What I like about the job Kerr has done this season in Golden St. is getting players to buy into his system. He has preached better defense and ball handling from point guard Stephen Curry who responded by being named league MVP. Kerr is an excellent tutor to both Curry and fellow Splash Brother Klay Thompson who love to shoot the three like Kerr did in his playing days. In addition, Draymond Green was inserted into the starting lineup this year and has blossomed into a star. A great example of Kerr getting players buy into believing what is best for the team is having former NBA all-stars, Andre Iguadala and David Lee coming off the bench this year in favor of Barnes and Green, respectively. Both players have seen their minutes diminish, but Kerr has Iguadala and Lee making strong veteran impacts for the Warriors off the bench. Kerr may have made it to Arizona only because Olsen had noticed him while recruiting other players. But, that decision continued the strong family values Kerr learned at home from his parents. I am sure Malcolm Kerr is looking down on his son and is proud of the successful player, husband, father, and coach he has become. This writer will be rooting for Kerr and his team to win their first NBA title since 1975 when Rick Barry was shooting foul shots underhanded.